The roots of healing and medicine in ancient Greece lie in religion and spirituality. Asclepius, the Divine Physician, was worshipped as a god, and supplications were made to him for healing. 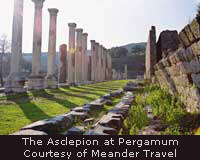 Healing sanctuaries called Asclepions, dedicated to the god of medicine, were established throughout Greece, usually in settings of awe-inspiring natural beauty and scenic grandeur. The main Asclepion was in Epidaurus, with important branches in Cos and Pergamum. There, physician - priests practiced a kind of spiritual healing centered around dream therapy on patient - pilgrims, who came seeking a healing intercession from the Divine Physician. Then the supplicant was admitted into the sanctuary proper to participate in the Asclepian rites. Offerings were made, usually in the form of gold, silver, or marble sculptures of the body part to be healed. Sometimes, coins were tossed into a sacred spring. The priest invoked suggestive prayers to the supplicant, and also included accounts of previous cures, to put him into a positive and receptive frame of mind. Then the supplicant entered the Abaton or dream incubation chamber for one or more nights, to receive a healing dream from Asclepius. If the patient - pilgrim was lucky, he would receive a personal visitation from the Divine Physician himself, who would either heal the supplicant directly in the dream state, or tell him what to do to cure his illness or affliction. Other dreams were less direct, and more symbolic. The physician - priests at the Asclepions were also master dream interpreters who would divine the treatment to be followed from the patient's account of the dream. The god Asclepius had certain totem animals in whose guise he liked to visit the supplicants as they slept. These were the dog, the rooster, and of course, the snake. From the ancient Greek Asclepions comes the concept of the healing retreat or sanctuary, the sanitarium where people go to take the Nature Cure. You can find their descendants in the health spas that are so popular throughout Europe. Sometimes these even have an overtly religious character, as in the healing sanctuary at Lourdes. Today, modern scientists praise and emphasize Hippocrates' establishment of medicine as a rational science and his freeing of it from the shackles of magic and the supernatural. But the fact remains that Hippocrates' father was a physician - priest in the Asclepion at Cos, where the young Hippocrates got his first practical experience and training in the art of healing and caring for the sick. Even the great physician Galen received a lot of his early training and instruction in medicine from the physician - priests at the Asclepion in Pergamum. by Kevin V. Ergil et al Copyright 1997 by Publications International Ltd.